Following some comments from readers, we published a post at the end of September comparing Philadelphia Union players’ scores on the Castrol Index with the averages of their post-match PSP player ratings. While the Castrol Index is designed to be an objective measure of player performance in which “every move on the field” is assessed based on “whether it has a positive or negative impact on a team’s ability to score or concede a goal,” player ratings, while informed by match statistics, are an inherently subjective assessment of how a player performed in a game. Naturally there were differences. For example, Gabriel Gomez, Freddy Adu, Michael Lahoud, and Danny Cruz all featured in the top 11 of the Castrol Index but were not in the top 11 of the PSP player ratings averages. The top five of the PSP player ratings averages were all defensive players. Jack McInerney, No. 1 on the Castrol Index, was No. 9 in the PSP ratings. So, now that the season is over, how do the Castrol Index and PSP ratings compare? The chart below displays rankings of Union players based upon the end of the season Castrol Index numbers and the final average of PSP’s player ratings from league games. The numbers in paranthesis indicate downward and upward movement in each ranking. Looking at the top 11 players, the two rankings include eight of the same players, albeit at different spots. The other big discrepancies between the two rankings are the placement of Gomez, Adu, and Cruz. Gomez comes in at No. 7 on the Castrol Index, down two spots from where he was ranked on the team at the end of September. In the PSP rankings, he comes in at No. 15, down three spots from when we first compared the two rankings. Adu stays at No. 9 on the Castrol Index but drops one spot to No. 17 in the PSP rankings. Cruz moved up one spot to No. 10 on the Castrol Index and moved up two spots to No. 13 on the PSP rankings. Turning to the differences in where Union players rank in the league on the Castrol Index, the five biggest gains were made by Hoppenot, Gabriel Farfan, Gaddis, Daniel, and McInerney. The five biggest declines were seen by Gomez, Adu, Valdes, Cruz, and Lahoud. Lahoud placed in the top 11 of the Castrol rankings at the end of September. Since then, he’s been bumped out bu Gabriel Farfan. 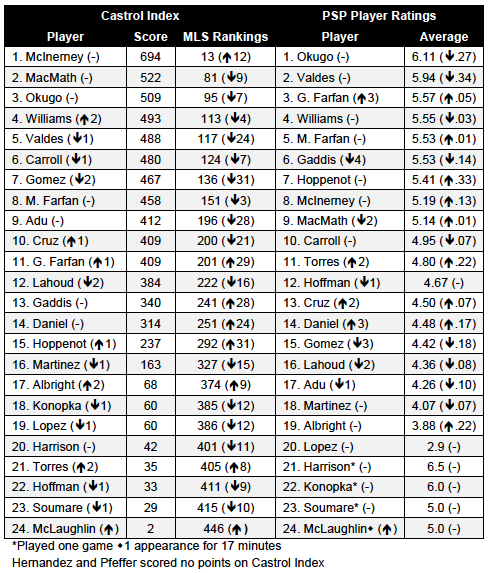 Looking a the PSP rankings, notable changes are the exchange of spots by Gabriel Farfan and Gaddis, Daniel’s improved rating, and Lahoud’s decline. Wow, for all the problems MacMath has had this year he is almost a full point higher than #2. James and Jack, I found an error in the Excel file I used to record the player ratings (misplaced decimal point) – new chart will be up momentarily. That PSP ratings are always interesting but are far too subjective and the author usually reacts too strongly for or against people he likes or hates while not raisin or dropping them enough. For example a good game by Adu would result in a 6 or 7 while an average game instantly makes him a 3 or 4. The same results for Marfan would be 9 and 5 respectively. That being said, where the heck do these castrol numbers comes from? I guess this is why soccer is such a subjective sports, sometimes you just can’t use stats.